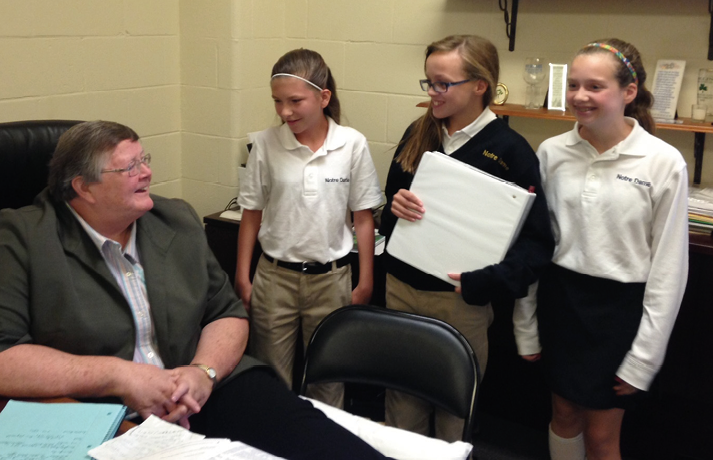 Sr. Anna Mae Collins, CSJ, speaks with students at Notre Dame Jr./Sr. High School. Catholic school alumni are often sad that priests, sisters or brothers are not found in our schools like they remember. Today, Catholic schools in the Diocese of Syracuse embrace the rare, but valuable, presence of a member of a religious order among faculty and staff. Sr. Anna Mae Collins, CSJ, has spent more than a quarter of a century at Notre Dame Jr./Sr. High School in Utica, New York, serving the past eight years as principal. Her roots in Oneida County reach back to 1974 when, as a second-year teacher, she taught at St. Mary’s School in Clinton, New York. As a 2012 recipient of the Syracuse Diocese Catholic Schools Witness of Faith award, she was quoted as saying, “I’ve always been respectful of the students and open to them.” That is a standard she lives by and what she expects of the entire Notre Dame community. Notre Dame Schools Chief Financial Officer Kenneth McCoy said he and a colleague were discussing a particular disciplinary incident with Sr. Anna Mae one day after school. Even when discussing how lucky Notre Dame is to have religious in the building, Sr. Anna Mae is careful to be respectful to other schools that may not have this luxury. “It’s not better, just different,” she said. Notre Dame schools currently have four religious orders represented by six individuals. Besides Sr. Anna Mae, a member of the Sisters of St. Joseph Carondelet; Sr. Paula Gallant, DC, and Sr. Helen Gertrude Carroll, DC, both members of the Daughters of Charity, provide support services for junior and senior high students. As a Xaverian Brother, Br. Leonard Wojtanowski, CFX, manages alumni relations for the former St. Francis deSales School. He maintains the presence of the order that not only served St. Francis deSales School but founded Notre Dame in 1960. The most recent addition to Notre Dame Jr./Sr. High is Sr. Jacqueline Johnas, CSJ, another Sister of St. Joseph Carondelet, who has taken the school’s fledgling international program under her wing by providing support to a number of new Chinese students. In addition, Sr. Therese Marie Kodz, CSSF, a Felician sister, teaches religion and remedial math at Notre Dame Elementary School. “What is good is that they, in particular, have the opportunity to share their gifts in small groups. The students really get to know them and they make strong connections,” Sr. Anna Mae said. It is this personal approach that Sr. Anna Mae also uses to reach out to individuals right where they are. For instance, she ex­plained, during Vocations Week stud­ents have some very frank questions regarding the vows of poverty, chastity and obedience. She said they find it inter­esting to learn that for the religious, poverty is not simply about living without material items. “I tell them how I receive a small stipend that covers my living expenses, but that the vow of poverty is about much more than that. It is about using your resources to help the poor and to have the ability to educate and help people make a better life for themselves and their families,” she said. Sr. Anna Mae explained that for people of all ages today the distinction is blurred between religious and lay people. This is especially so with smaller numbers of people called to religious life, fewer parishes and fewer differences in dress. 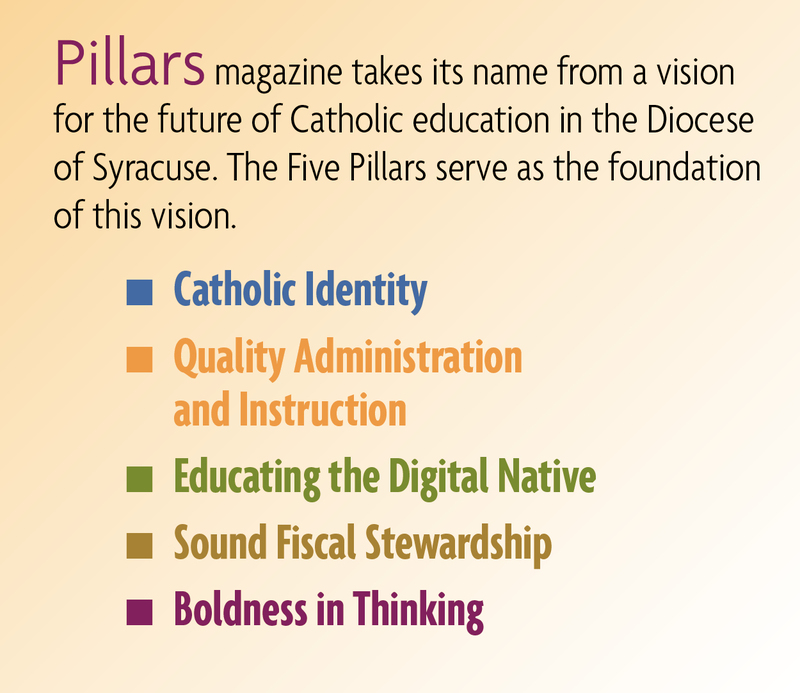 The personal relationships built by the religious in the Catholic schools of the Syracuse Roman Catholic Diocese help students and families learn about this distinction and build bridges not just for the educational environment, she said, but for learning about and respecting each other along the way. Dyann Nashton is the development director of Notre Dame Schools.